Back on the water with the hungery togs. I have finally finished the tour DVD this week and send it off to the presses, and I was finally able to get out on the water. The water is at the the perfect tog temperature and they have been hungry. Lee, Damien and I hit the tube of the Island early in the week. They were in they're holes and and hard to find, but once a bait was taken, we worked that area and where into them. Lee and I got out the next wind window and the togs where on fire. We found bunches of them in each spot we tried, with the average size in the 16" range. Lee had the largest at 22.5 inches and when he landed it he thought it was his long awaited citation tog, but it was a half inch short. It was an epic day with at least 15 tog each, it was the type of day we paddle out there for. The anticipation of the big striper is high and a few have been caught in the area. 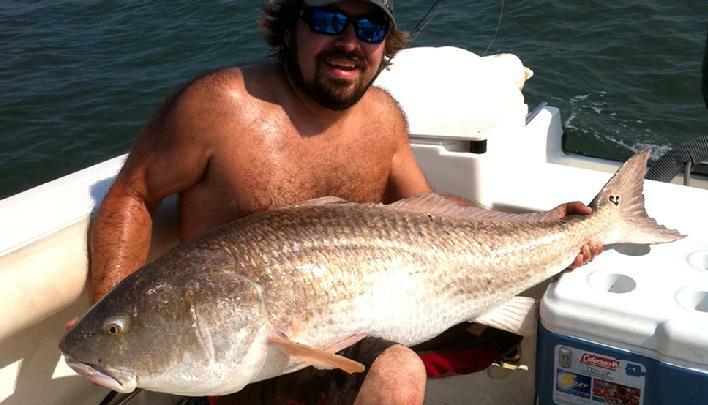 A 46"er was landed north of the ships, Chris at Chris' Bait and Tackle weighed in a 42lber this past week. I got a report from work (Oceans East2) from a crew that landed 4, 40"ers at the high rise on friday night, so they are here, at least some of the early scouts have moved in. I'm wanting one more day on the tog before fully change gears and target the Kipto area. Working at Oceans East tackle shop has its advantage and its disadvantages, like, when everyone comes in to weigh citation sheep and tog when your there working. It�s great to get the reports first hand, but it�s tortuous not being able to get out on�em. Its even worse the day you do get out the bite has stopped. Damien and I paddled out to the island geared for reds and sheep/tog fishing. We soaked baits for about two hours for the reds as we waited for the current to slow down. Over the tube the bite was terribly slow, the current ran longer than predicted and being hammered over the previous calm days took its toll. We saw a few small tog and sheepies caught around us but we only caught a couple small togs. The next afternoon, Lee, Ric and I found a few fish. Lee had the only red, Ric and Lee landed a few spike specks, I hunted the silver drum and found two 16�ers. Lee, mike, miles from mobjack bay, and I hit the island this week with sheepies as the main target and flounder second. I have been seeing citations from both coming in to work (Oceans East II) in the past week. We set up on the tube and mike had the first obvious sheep run but came unhooked about 3 sec into the fight. I got the next lucky hit and landed a 22 incher. I haven caught one over the tube in a long time and forgot how much more fun it is with out the threat of the pilings. Lee caught a trigger, and then I caught one. Mike caught a small tog then Lee caught an 18�er. Then I caught a 24� sheepie, and then it was time to get off of the tube and out of the current. We jigged for flounder around the slack side of the island. My friend Ryan Jones who is an artist at Jones art gallery, dropped a jighead and gulp from is boat down for flounder. I look over and he is bowed up. I watched for a second until the tip of his rod bounced and I knew is was not a ray! We paddled over to Ryan to film and cheer him on. 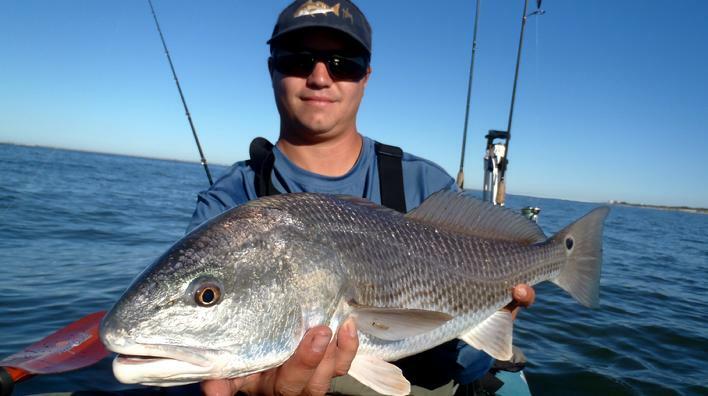 He is a good fisherman with plenty of outstanding catches but hasn�t landed a big red. When he had it boat side he wasn�t to sure how to land it by himself. 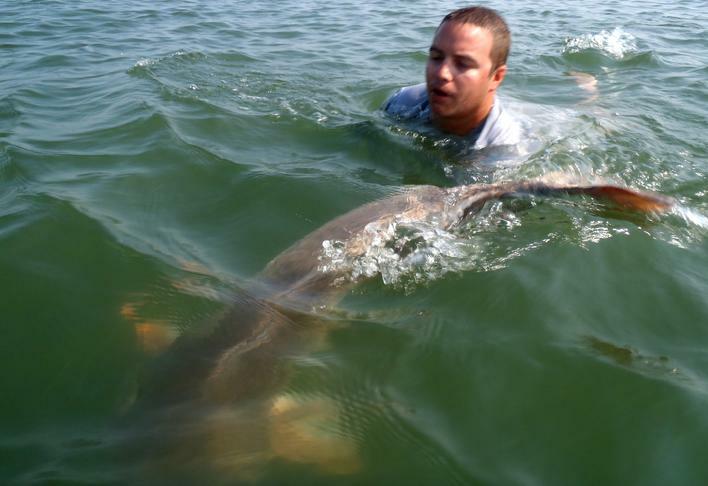 Lee climbed out of his kayak and in to Ryan�s boat, grabbed the net and helps land the 49 incher. After the pictures, Lee got in the water to film the release. Ryan lost his grip on the tail, so Lee swam the red upright until it was bearing down on his hand. It was fun for all of us to see Ryan and the red circle is boat and landing the beast. The fall red run is on all over and they are on the move and within kayaking range throughout the area. Red reports from the sandbridge pier have been coming in, and a kayaker bottom fishing at the ships landed a 45 incher that won him first place red at the TKAA tourney. It is definitely feeling like the start of fall with the night time temps in the 60�s but the bay water temps are in the mid 70�s, its not full on fall yet. I have been putting in most of the week editing the tour DVD but allowing myself one day to fish. I saw the conditions to hopefully sight some reds on the e-shore. I knew a swell was coming with another hurricane heading up off shore so I wouldn�t get another chance for a few days. I got a new Berkley powerbait that I wanted to throw at a red. It�s a big shrimp with an internal weight and hook like a swim shad. I think really looks like a mantis shrimp. The water was clear enough to see what I needed to see and land two. the first one was in a small school of about 8 reds in the low 30� range. They were heading into me and I saw them first, I squatted down and flipped the shrimp in front if them and let them come to it. I twitched as they were about to go over it and one grabbed it. I had a great tight drag splashy fight that came across as fun on film. The next one was alone and right under the peaking one foot breakers. Again he was heading head on, I squatted and he made a u-turn in front of me, that�s on film too! I flip to my side, missed him and he pushed once with his tail to the deeper water. I pitched beside him and he ran at it, catching it before it hit the bottom. I was still facing the shore line and as a peaker rolled under me the 33 inch red spun me 180* and snatched me out of the surf zone. A saw a few more as the day went on but they were not as aggressive. As I ran over them they got real skittish. Sighting and stand fighting reds is one of my favorite things to do, but my priority is doing a good job on the tour DVD. The sooner I can get it done the sooner I can have more opportunities to GET ON�EM!